A falcon statue outside Mercedes-Benz Stadium in Atlanta, Georgia, where Super Bowl LIII was hosted on Feb. 2. Junior Alyssa Dennis attended the game with her sister Olivia. "It was very different and very hype," Dennis said. The Super Bowl is typically a popular attraction for WHS students. 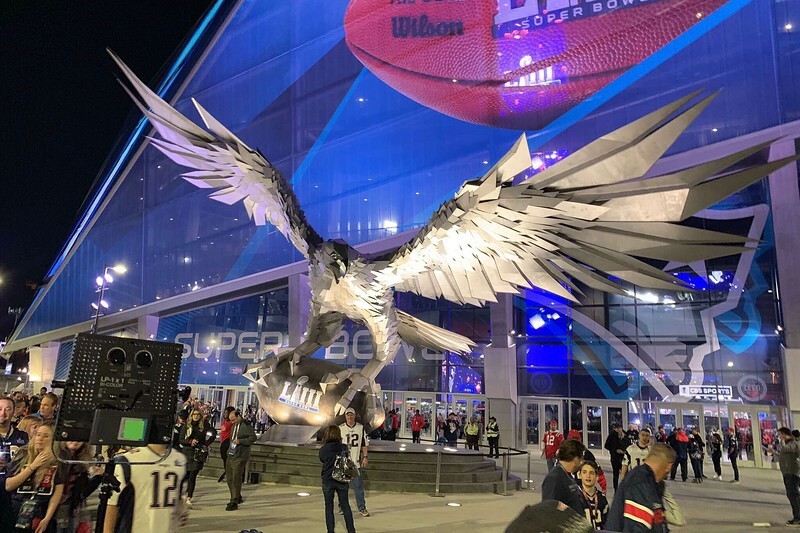 However, only a handful of students attended this year’s Super Bowl LIII in Atlanta, Georgia. 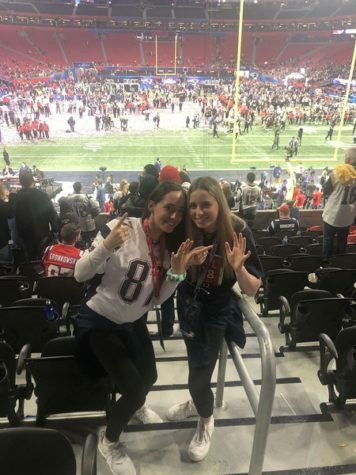 Junior Alyssa Dennis and her twin sister, Olivia, watched the New England Patriots defeat the Los Angeles Rams, 13-3, in the lowest scoring Super Bowl game in history. 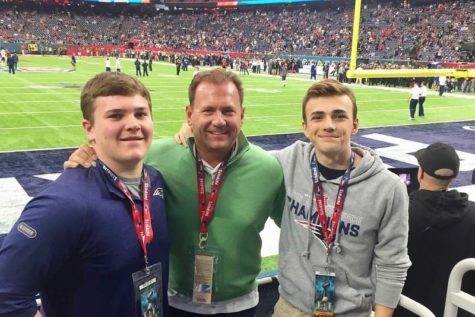 In 2017, senior Brooks Jones and his brother, junior Cameron Jones, attended Super Bowl LI, where the Patriots defeated the Atlanta Falcons 34-28 in overtime. Even though this year’s Super Bowl wasn’t as much of a nail-biter as it was in 2017, Alyssa Dennis still enjoyed the game. “It was very different and very hype. We met [up] with a bunch of other families that we know, [so] just being able to be with people I knew to experience history, it was just awesome,” Alyssa Dennis said. Juniors Alyssa and Olivia Dennis hold up six fingers for Patriots quarterback Tom Brady’s six rings to celebrate the Patriots victory. Unlike previous Super Bowl games, this was the lowest scoring game in history. Like most fans, Alyssa Dennis was surprised with the first touchdown being in the 4th quarter. Despite being a primarily defensive game, fans were still on their toes waiting for anything to happen. According to Alyssa Dennis, just being in Atlanta added to the special experience. Each year, fans look forward to the Super Bowl halftime show, an event that makes the game even more exciting and memorable. In 2017, Lady Gaga performed at the break, and this year’s performance was led by Travis Scott, Maroon 5 and Big Boi. However, for both games, Brooks Jones and Alyssa Dennis agreed that the show wasn’t as good as they had expected. Alyssa Dennis re-watched the halftime show on TV with her dad to compare each version. To most fans watching at home, it would seem that watching the Super Bowl in person is better than watching it on TV. However, according to Brooks Jones, TV has its perks. Brooks Jones’ favorite part of his Super Bowl experience was witnessing the Patriots’ comeback win in overtime. Senior Brooks Jones and junior Cameron Jones stand with their dad, Clayton Jones, at Super Bowl LI in Austin, Texas. Overall, Alyssa Dennis also had a fun experience at the game, and she hopes to go again in the future.